It’s one of my favorite days: home tour day! I love home tours for a few reasons. It’s fun to get a peek inside so many talented bloggers’ homes and see their decorating ideas for different seasons. Plus home tours force me to finish decorating and clean the house! 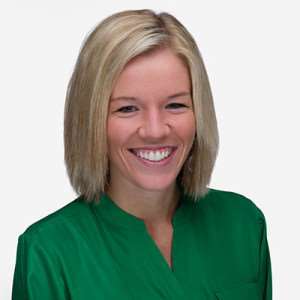 Thanks to Annie from DIY Decor Mom for organizing the Christmas home tours this week. Annie is a fellow Wisconsin blogger, and I’ve been lucky enough to meet her in person a few times. We even got to meet Nicole Curtis together! If you’re popping over from another blog on the tour, welcome to Green With Decor! I love decorating with green, which is pretty easy around Christmas time. My husband Kalen and I renovated pretty much our entire house. You can read more about that here or learn more about me here. 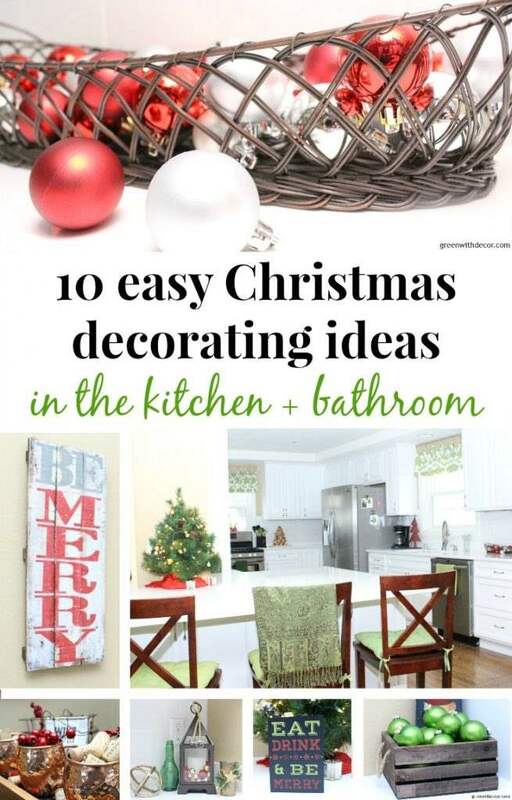 I’m sharing easy Christmas decorating ideas for the kitchen and bathroom today. I have a few Christmas decorating blog posts coming up between now and Christmas, so you’ll see more of the house all decorated soon! I love our white kitchen. You can see the before and after of the renovation here. I feel like you can’t really appreciate what this room is now until you see how it was when we bought the house: an awful galley kitchen with blue cabinets and a yellow oven (yes, yellow). I tried to mix things up from last year and not put everything in exactly the same place. I’m loving this mini tree on the kitchen counter. It’s easy enough to put up and really dresses up the kitchen for Christmas. There’s really nothing better than being home at night with the Christmas lights twinkling all around the house, don’t you think? The tree was my grandparents’ so it’s extra special. I love using my grandparents’ old Christmas decorations. The gold ornaments on here are a random mix: some were my grandparents’, some are jingle bells, some I’ve bought over the years, some came from an old Christmas decoration. But they all blend together just fine! I used a red pashmina as the tree skirt. In the living room, I used an old Christmas table runner. I love when you can just use decorative pieces for something other than their intended purpose. The cork chalkboard is a simple project, and so is the JOY sign. Chalkboards work throughout the year since you can write whatever you want on them. I was decorating with Christmas music on a few days ago and heard the line “pour yourself a cup of cheer” and knew it was perfect for the chalkboard above our Moscow Mules. I love setting up the top of our little wine fridge. Moscow Mules are perfect for decorating for any holiday. They just always seem to work and add a bit of cheer to a room. My brother Stephen was over the other day and asked if he was allowed to use the mugs or if the corks and berries had to stay in. Ha, of course, you can use them. I just love how they look displayed when we’re not sipping on mules. I went a little ornament crazy this year, but they add such a festive touch to anything: baskets, vases, lanterns. I love this little corner of the kitchen, too. That gold candle was my grandparents’. I have a bit of a bottle and jar hoarding problem. But you probably already knew that. The green bottle was from some kind of sauce or something we bought; I honestly don’t even remember what, but I love the bottle. Of course, Oakley is always hanging around when I’m taking pictures. My craftiness is apparently rubbing off on Kalen, because he made this awesome cork tree for me. I switched out a lot of our wall decor with Christmas pieces this year, and it makes the whole house feel more festive. I have a wine bottle hoarding problem, too. I used these berries all over the house as an inexpensive way to add some Christmas cheer. ‘Believe’ is one of my favorite words, and it’s perfect for Christmas. I just made this cute little DIY Christmas button card. I added a few easy Christmas pieces in the bathroom, too. We debated renovating this room back when we bought the house, but ultimately decided to keep the original charm. The fact that we were spending a ton of money on renovating the rest of the house definitely weighed into our decision! We have so many people say nice things about the tile that I’m really glad we kept it. I love the red box for tissue. It’s the perfect size! The white Christmas towels used to be my grandparents’. Towels are such an easy way to add a little holiday touch. The one hanging on the stove in the kitchen was a TJ Maxx find. And one more fun idea for ornaments here. The vase was actually one of several vases we used as centerpieces at our rehearsal dinner. I swapped out the usual corks in there for the red ornaments. Such an easy way to get a festive feel in here! What other easy Christmas decorating ideas do you have? Remember to hop over to the other ladies’ holiday tours this week for more Christmas decorating ideas! I absolutely LOVE the Santa tissue holder. It’s been put on my DIY list. Great tips – and I love seeing your beautiful kitchen!